I've been working on some cleaning and organizing, which is something I do pretty often. I came upon this piece of paper and chipboard pieces and remembered why I bought them. So I stopped organizing and put this banner together. When I planned it, the word in my mind was SPRING, but that has long passed, so I went for JOY. I didn't do anything fancy. This is one piece of 12x12 paper, five chipboard pieces, some sticker letters and three flowers from my stash. 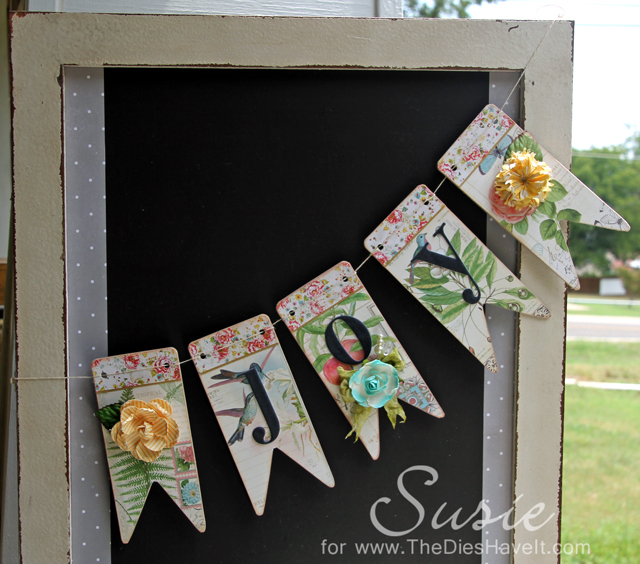 And now it resides in my craft space and reminds me to be joyful. SCORE! Great project Susie! Thanks for playing along at The Crafty Scrapper for our Stash Busters Challenge! !